GE, now owned by Haier, is relaunching its GE Cafe’ line of appliances. While GE Cafe’ has been around for some time, it’s been thought of more as a “style” within the GE family than a separate brand. GE Cafe’ appliances have been styled like a “pro” line of appliances differentiating GE Cafe’ from the upscale GE Profile appliances which has been GE’s step-up premium appliances. 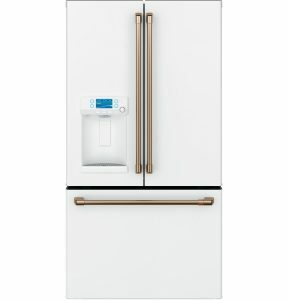 GE Cafe’ has always been an upscale product with a premium price, but not in the high-end luxury category of GE’s Monogram line of professional style luxury appliances. The new Cafe’ line appears to be separate from the “old” GE Cafe’ in several respects. First, while part of the GE family of appliances, the product line is no longer “GE” Cafe’ but just Cafe’, a minor but important distinction. GE Appliances now is responsible for marketing these brands in the US: Monogram®, Café, GE®, GE Profile™, Haier and Hotpoint. The Matte Collection of Cafe’ will include wall ovens, ranges, cooktops, French door refrigerators, dishwashers, and vent hoods. There will be 2 smudge resistant finishes: matte white and matte black. In addition there will be a choice of brushed hardware, knobs, and handles. Both the matte white and matte black appliances will also have a choice of brushed hardware, knobs, and handles. The hardware can be ordered in brushed copper, brushed stainless steel, brushed black, and brushed bronze. The products will also feature a distinctive copper cuff with the Cafe’ logo. Look for more distinctive and exclusive products aimed at the Cafe’ consumer niche’ to debut at Arizona Wholesale very soon.